Welcome to the Gemini FJ Register and Heritage site. This site was constructed to preserve the history behind the building and racing of this brief but shining star that once graced the Racing tracks. The site came about following the purchase of an un-restored Gemini Mk II FJ from Dallas Texas July 2008 by Nigel Russell and Roger Herrick, Some characteristic features of the car were not evident on other Gemini Mk II. Finding no central authority on Gemini cars, and information on the internet scant at best, we embarked on a journey to establish the cars history; Along the way researching information behind the origins of the Moorland cars and the various Gemini marques and there history. We have been honoured to talk to many people, Drivers who either raced the cars in period or worked at the Chequered flag. The result is we have we have set up this site to share the information, the photos and some of the memorabilia. 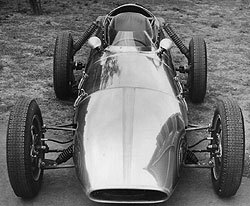 The Gemini Registry is therefore dedicated to the pursuit of preserving the history and documentation behind the Moorland FJs built by Les Redmond and the subsequent Gemini Formula Junior cars built by Graham Warners establishment, The Chequered Flag Engineering Co through 1959 to 1963. In doing so we have attempted to also record the histories and identities of these people and those associated with the establishments. The site hopes to catalogue the location, ownership and importantly the history of the remaining Gemini cars in existence. We welcome and encourage the submission of details of owners and cars not currently listed along with historic photos or information. Whilst every care is taken to ensure this Register is correct Gemini FJ Registry can take no responsibility for any errors that may occur. If you own a Gemini FJ and would like to help us develop the Chassis Register please click HERE.